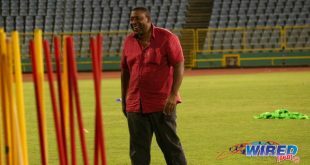 Inspired by our very own “Little Magician”, Russell Latapy, Guaya United captain and playmaker Ryan “Fry” Stewart has broken barriers to arouse the passion of the next generation of players from his native Mayaro. A three-time NAIA All-American at Lindsey Wilson College and a professional player with Indiana Invaders and Cleveland City Stars in the USL as well as Pro League teams Caledonia AIA and North East Stars, Stewart is focused on helping his hometown team, Guaya, to retain their National Super League (NSL) title today. But he took time to have a word with Wired868, after a derby win over Matura ReUnited at the Turtle Nesting Village in Matura. 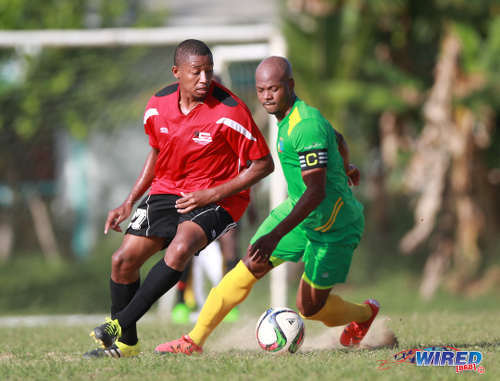 Photo: Guaya captain and playmaker Ryan Stewart (right) is watched closely by Matura ReUnited midfield ace Zavion Navarro during 2015/16 CNG NSL Premiership Division action in Matura. What school did you attend? I attended Mayaro Government, then Mayaro Composite. After that, I moved on to the United States where I played with Lindsey Wilson College (and) then I played in the USL (United Soccer League). 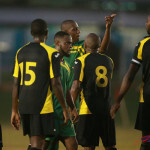 Photo: Guaya United captain Ryan Stewart (centre) shoots for goal during the 2015 CNG National Super League KO semifinal against Tobago 1976 Phoenix FC. I love to read, I have a strong belief that knowledge is power and you never stop learning. So I love, love reading. I have multiple books that I read just for information sake. Napoleon Hill: Think and Grow Rich. In my free time all I do is football. Football is my free time. It’s the moment in my life that I put aside everything, the bills, work, family issues, and I just express myself. So my free time whether it’s on the field or at home is football. Coming from the humble town of Mayaro, I was always told that you too small, you will never make it, you’re too hasty… Things like that. I came from a drug-ridden, gun-ridden, gang-ridden street. Football was my way out. Football was my escape and has always been my escape. 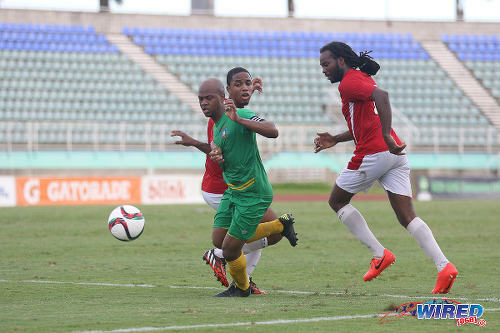 Photo: Guaya United captain Ryan Stewart (right) holds off W Connection midfielder Silvio Spann during the 2013 Toyota Cup. My aim in life is to just change the way people look at football. Football was the one thing that kept me away from being a “rude boy.” Football has given me everything I have, from my education to being one of the better known players in the south-eastern region. I always say when I came out of high school, we had nothing, no team, nothing to look forward to in terms of football. I had to leave Mayaro and come into Port of Spain. Jabloteh picked me up first but I ended up with Caledonia. It’s through Caledonia I got the scholarship and moved to the US. 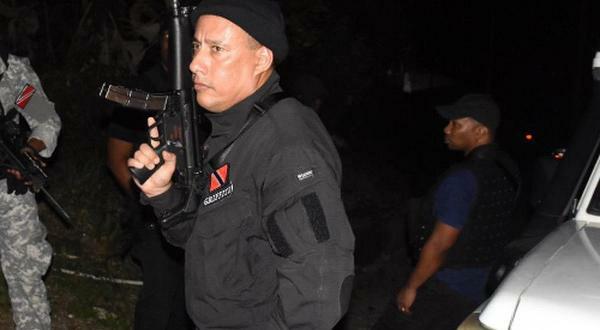 So coming from the guy walking around Mayaro or riding a bike within the community to sitting down on FOX or (playing) a division two final on FOX Sports was kinda a big thing. Now coming to the end of my playing days, I want to see more (players from the area achieve too). Not Just make a trip to the US but across to Europe. That’s my motivation with Guaya United. 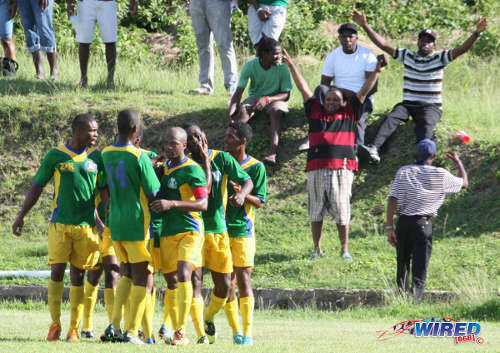 Photo: Guaya United captain Ryan Stewart (centre) celebrates with teammates after a goal from Russell Alfred (second from right) during a 2013 Super League clash with Westside Superstarz. How did you start playing football? Joseph Weekes has been the drive behind me, my father figure and the guy to pull me up when I’m slipping. 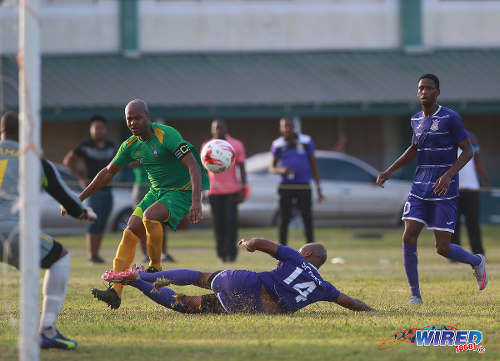 Photo: Guaya United captain, playmaker and co-coach Ryan Stewart (left) glides past Petrotrin Palo Seco defender Wayne Huyghue (right) and his teammate in the 2015 CNG National Super League KO final. Very straight forward. I don’t shy away from saying things that need to be said within the confines of being respectful. Is there a difference between your on and off field persona? They have the notion that “he always quarrelling” but when I am on the field it’s a different personality to when I am off the field. I also understand I’m not the biggest guy so I have a fire in my belly when I play and people think that is how he is. There is only one team, FC Barcelona, in terms of history and what they stand for. I love the fact they have a (strong) youth system, so there is a platform to move from U-10 or U-8 straight up to the senior team… I am actually saving now for a trip to Barcelona, I have to go to the stadium, have to go through the tunnel and get all that feeling. Most importantly, they show the world that you don’t need to be six feet tall to be the best player in the world. 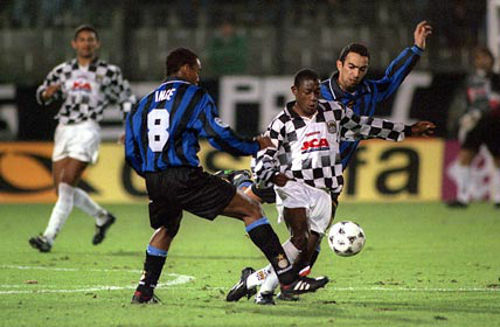 Photo: Trinidad and Tobago playmaker Russell Latapy (centre) shows off his dribbling ability for Portuguese club Boavista against Italy’s Inter Milan in European competition. His victims here are former England captain Paul Ince (left) and France World Cup winner Youri Djorkaeff. Russell Latapy. Russell has been the player I have modeled my game around, so much so when I got drafted out of college to play USL Division II, the coach, Martin Remy, said I reminded him of Latapy. I had the opportunity to play with him at Caledonia (towards the end of Latapy’s career). 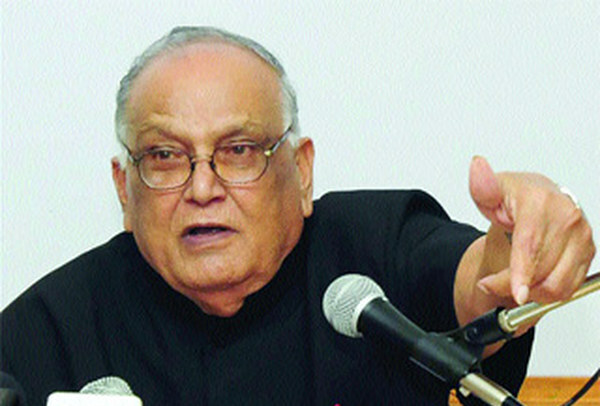 I was baffled, because I am looking to learn from (him). Russell Latapy is my favorite player. What make you special as a player? In the game what I think makes me stand out is my touch, in terms of how I will handle the ball under pressure, my positioning and stuff. I think that will give me the edge to stand out. 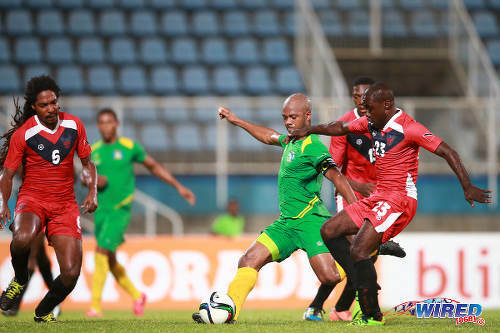 Photo: Defence Force stopper Dwight Scott (centre) dives in to tackle Guaya United captain Ryan Stewart while Army left back Tevin Balfour looks on during 2015/16 CNG National Super League action in Guayaguare. What is your ambition in football? 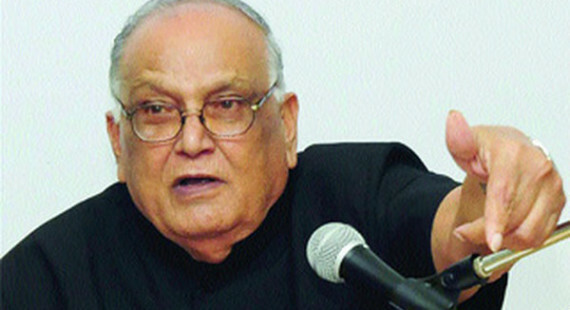 At the moment, it is to get Trinidad and Tobago talking about Mayaro/Guaya. We have lost our way somewhat. Since after the Mayaro United team, I joined Guaya United firstly to let Trinidad and Tobago know that there are some players up there that we need to pay attention to. As I mentioned earlier, when I got out of high school we had nothing. We had no team that could bridge (the gap between our) secondary school football and Semi Pro structure. Joining Guaya United, we created the platform. So instead of a youngster having to leave to go to Port of Spain like I had to go to Caledonia, or San Fernando, we have an avenue right here for them to learn and grow. We want the youngsters that are ball boys now to play for Guaya United one day. 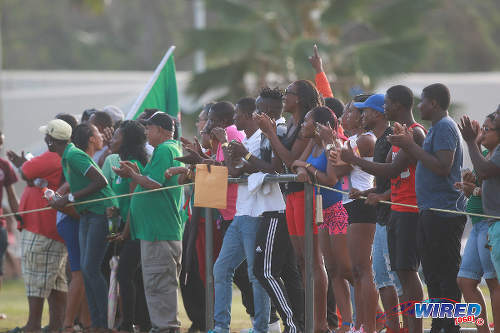 Photo: Guaya United supporters get behind their team during 2015/16 CNG National Super League action against Defence Force in Guayaguare. 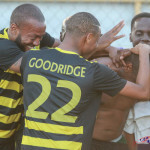 Editor’s Note: Ryan “Fry” Stewart and Guaya United won their final game of the season 3-1 against La Horquetta SA but finished second as leaders Defence Force routed Stokely Vale 8-2. Allan Powder is an avid writer currently pursuing his BA in Mass Communications at COSTAATT. He is employed as an IT professional at Republic Bank Limited, and is a freelancer at Wired868. Powder is also a certified photographer. Great story. Threw my memory back to Peter Alfred. Ahhh. Right. 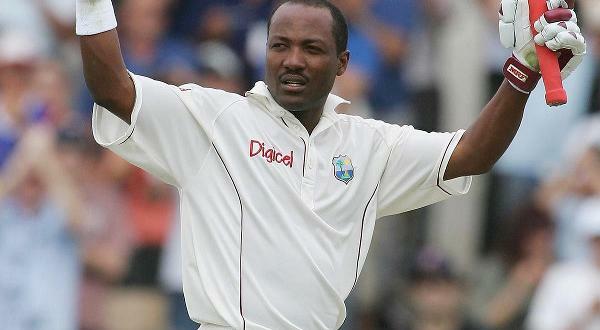 I know Collin Samuel is from Mayaro too, right? Perhaps Samuel would be the most successful player from the east coast. Yes. I remember him. Didn’t see him much. But I remember him. Colin played in a World Cup and scored against Glasgow Rangers at the Ibrox. Hard to beat that. Lol. I understand perfectly. Like Jamaal said, that is a helluva sacrifice. Hope I see Ryan in the Pro League before his career ends. Definitely one of the country’s most talented midfielders. Sport and culture are nourishing for the soul. Not everything can be calculated in pure dollars and cents. Sometimes there are other equally valuable tangibles. But I’m sure even if we did do the maths, we’d see that investing in a kid for ten years to play a sport (and allowing him to become a contributing adult member of society) is a lot more cost effective that paying for an adult to live in jail for ten years ( and not give anything back to society). And yeah, that’s not even counting the intangibles you’re talking about. A little vision is what we need.